2K Sports and Euroleague Basketball announced today an exclusive multi-year global partnership that will see top teams from the Turkish Airlines Euroleague introduced into NBA 2K14, the next installment of the top-selling and top-rated NBA video game simulation franchise*, for the Xbox 360® games and entertainment system from Microsoft, Xbox One®, the all-in-one games and entertainment system from Microsoft, PlayStation®3 and PlayStation®4 systems. 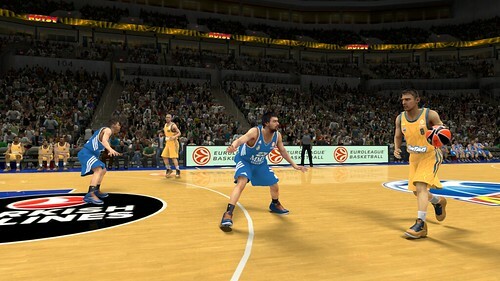 This will mark the first time Euroleague teams have appeared in the critically acclaimed NBA 2K series. Fourteen teams in total will be integrated as playable teams in NBA 2K14, allowing fans of European basketball to pit their local teams against the biggest teams from the NBA for the very first time. Olimpia Milano, EA7 Emporio Armani is delighted to be one of the fourteen teams chosen to be part of NBA2k14. Olimpia is the winningest team in the history of Italian Basketball with 25 Italian championships to go along three European titles. Now its fans will have the opportunity to simulate games pitting our team against the very best in the World enhancing the level of entertainment. The other thirteen teams to be included in NBA 2K14 are: Alba Berlinì, FC Barcelona, Real Madrid, CSKA Moscow, Montepaschi Siena, Fenerbahçe Ülker Istanbul, Anadolu Efes Istanbul, Olympiacos Piraeus, Panathinaikos Athens, Maccabi Electra Tel Aviv, Zalgiris Kaunas, Unicaja Málaga, Laboral Kutxa Vitoria. Developed by Visual Concepts, a 2K studio, NBA 2K14 is not yet rated by the ESRB. Fans that pre-order for Xbox 360 and PlayStation 3 systems will receive the King James Bonus Pack at no extra cost on day-one — October 1, 2013 in North America and October 4, 2013 internationally. NBA 2K14 will also be coming to Xbox One®, the all-in-one games and entertainment system from Microsoft, and PlayStation®4 computer entertainment system later this year. For more information on 2K Sports, visit www.2KSports.com. For more information on NBA 2K14, visit https://www.facebook.com/NBA2K.